I hope that everyone had a great Christmas. We definitely did! By the time it was over I was sure Toys R Us threw up in my living room. lol So obviously the kids had a good Christmas, not just all the gifts, but we had family in and talked to family on the phone. Several times that day I heard from them "This is the best Christmas EVER!" *Big sigh of relief* This year Christmas was more stressful for me than I ever remember it being. Just seemed there wasn't enough time to get everything I wanted to do accomplished. As it was before the kids could open gifts on Christmas night R and I had to go in the bedroom and finish wrapping their gifts. Maybe next year I will be able to get back to my usual schedule and have a more relaxing holiday....We'll see. The last 2 days I have been thinking about the new year. As I look around the house I see lots of dust, lots of things out of place. I want to get things a bit more organized, and get a better schedule going so that I can relax more with the family. I mean truely relax. I spend lots of time with them now, but many times it is half hearted because I *have* to (ie I'm being forced by the baby to sit and hold him - therefore end up watching a movie or something with the kids and dad). In my head I have a zillion things I would/should be doing if this little person would just unleech himself from me for awhile. I want to find a way to get the things done that are bugging me so that I can really enjoy the time I get to spend with them. Anyone have any ideas how to do this with a leechbaby ;)? I think I will spend some of today getting some things put away, working with my homemaking journal and finding some routines that will work for me. I have been trying all week to get something posted aside from MPM. I don't know if it is just me, or has this week been crazy for everyone? It seems every day this week there has been a new stress, or something going on. Last night I finally had to have a talk with the children, there is just now way in the world I am going to be able to do everything we normally do this time of year. That doesn't meant we won't be doing something, it just means that some adjusts have to be made. Luckily everyone thought that would be ok. I really hate to disappoint anyone, but I'm just about at my limit this year. I never thought having an almost 9 month old would really slow me down as much as it has. I've been baking and making candy when I have had a chance. I really want to share the pictures and recipes with you all ,myself or my one lonely reader, whichever the case may be...;). Today is going to be a fairly busy day but I will see if I can at least get one picture and recipe up here later on this afternoon. There ya have it. Simple and easy I think for this week. 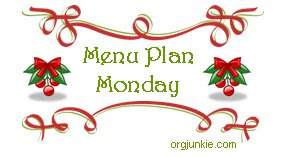 If you would like to play along or just see what others are cooking up this week, head on over to I'm an Organizing Junkie.